Summary: Katherine Johnson became more widely known with the book and movie Hidden Figures. 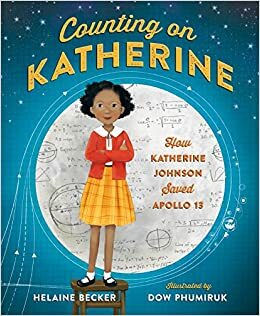 This picture book biography covers her life from her childhood in West Virginia through her role in helping to rescue the Apollo 13 crew. In between, she graduated college at age 18, became a teacher, then moved on to NASA, beginning her career as a “computer”. Her brilliance in math earned her promotions, allowing her to work on Project Mercury, where astronaut John Glenn requested her calculations before flying. She then moved on to calculating the flight paths for the Apollo missions, which is how she came to be called on when Apollo 13 was in trouble. Her assignment was to calculate a flight path that would bring the astronauts home with the little fuel they had left. She succeeded; the final page shows her gazing into space, a path of calculations connecting her to the moon, with the sentence, “She was now a star herself.” Includes additional biographical information and sources. 40 pages; grades 1-5. Pros: A good overview of Katherine’s life through 1970, with additional information in the back matter. Both the text and the illustrations emphasize the importance of math in Katherine’s life and work. Cons: A timeline would have been useful.